After performing in several European countries since June 23, the Camagua Folk Company, of the eastern Cuban province of Camagüey, returned to the island on Monday, praised by the public and congratulated by personalities attending the shows in which it participated. The International Music and Dance Festival of Les Preses, in Barcelona, Spain, closed the tour of the young dancers and musicians that, directed by Fernando Medrano, have a solid reputation in international folklore circuits. 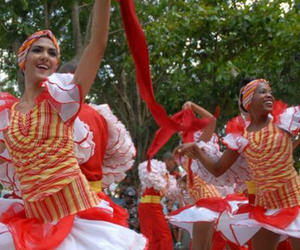 In addition to the Iberian nation, the Cuban artists toured Belgium, the Netherlands, Portugal and France, to attend a total of nine events, including the 22nd International Folklore Festival "Tarascon Latino", one of the most important organized by the Association of Festivals of the South. Alan Sutra, president of that entity, which invited Camagua to the tour and mayor of the French city of Tarascon, praised its high professionalism and artistic quality, as informed to the press by Augustin Martinez de Santelices, in charge of public relations for the group. During the summer tour, Camagua also received special recognitions, such as the medal for the 50th anniversary of the Op Roakeldais 2015 festival in Holland, and the certificate to Artistic Excellence in that event and in that of Burgos, Spain. Its shows bring together indigenous dance expressions of Cuba, with popular rhythms like the danzon, the mambo, the rumba, the guaracha, the guaguanco, and rural genres such as the son montuno and the pilon, and dances inherited from African tradition. They also include Caribbean and European influences, refers the group's site on the Internet.